Australian Mutual Provident Society, column, Lesley Gordon Corrie, Florence, Florentine Romanesque, frieze, J. and T. Gunn, Launceston, Launceston Examiner, lead lighting, newspaper, Alexander North, Romanesque, Romanesque Revival, semi-circular arch, Tas, Tasmania. 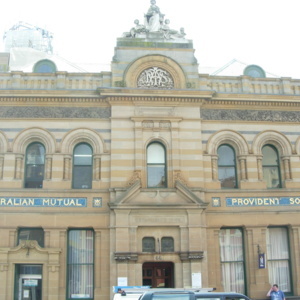 This Australian Mutual Provident Society building is in the centre of the Tasmanian city of Launceston. It was designed by local architects Lesley Gordon Corrie (1859-1918) and Alexander North (1858-1945) and built by J. and T. Gunn. It opened in 1892. An anonymous report in the Launceston Examiner newspaper (November 19, 1892) gives the particulars of the building, which is described as being in the Florentine Romanesque style. Romanesque features of the stone building include the semi-circular window arches with molding and decorated columns on the upper floor, the semi-circular arch above the company monogram, the use of foliage motifs, and the frieze above the entrance. Florence has a number of extant Romanesque buildings built between the eleventh and thirteenth centuries. The buildings provided inspiration for some of the Florentine architects of the Renaissance. Alexander North, Australian Mutual Provident Society, column, Florence, Florentine Romanesque, frieze, J. and T. Gunn, Launceston, Launceston Examiner, lead lighting, Lesley Gordon Corrie, newspaper, Romanesque, Romanesque Revival, semi-circular arch, Tas, Tasmania. “Australian Mutual Provident Society building, Launceston, Tasmania ,” Medievalism in Australian Cultural Memory, accessed April 25, 2019, http://ausmed.arts.uwa.edu.au/items/show/1259.